An online associate degree in theology expands your spiritual ministry and knowledge of scripture, while also laying the groundwork for a bachelor's degree in theology. With an associate in theology, graduates develop an understanding of scripture in its full context, and are prepared to share practical and educational insight with others through missionary work, church expansion, or as pastors. The annual salary for those who work in religious organizations as part of ministry/clergy ranges from $23,000 to $79,000, according to the BLS. The curriculum of an online theology degree explores books of the Old and New Testaments and basic theology. It also may include the study of Hebrew, Greek, or Aramaic to assist with the translation of ancient texts. Many students find studying theology a fulfilling and fascinating experience that prepares them for careers inside and outside the walls of the church. 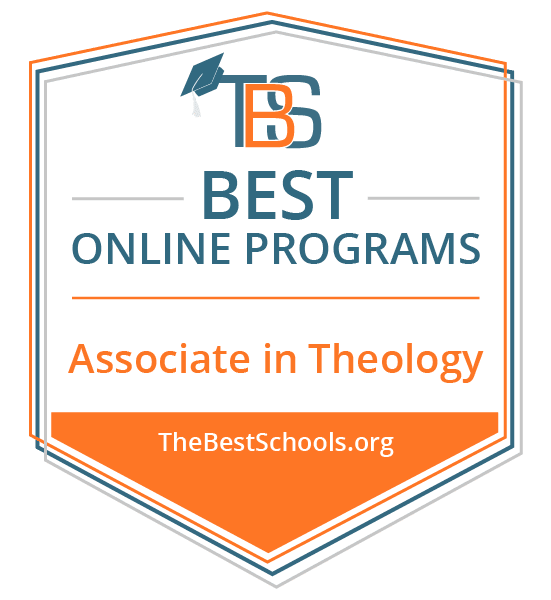 What Can I Do With an Online Theology Associate Degree and What Will I Learn? Grace College of Divinity ranks #1 on The 10 Best Online Associate in Theology Programs! Located in Fayetteville, NC on the main campus of Manna Church, Grace College of Divinity offers an affordable online Associate in Divinity degree. GCD's curriculum is tailored for those looking to serve their local church, and explores relevant material in biblical studies, theology, and practical ministry. Classes are delivered asynchronously, allowing students to complete assignments when it is most convenient for them. Experienced faculty lead ministry courses, and pastors or church administrators lead classes on day-to-day activities in church operation. The 60 credit associate degree can be completed within two years, and coursework explores world missions, systematic theology, counseling, and church history. Students complete 54 credits of required courses, six elective credits, and finish their degree with a leadership in action requirement. Material is delivered using Populi, and some courses are available in an accelerated, eight-week format. Online students also enjoy access to the library and an online writing center that offers tutoring for math, formatting, paper writing, and theology. Admission requirements include a GED or high school diploma, a pastoral letter of reference, a complete application, and a personal essay. GCD offers a 30% tuition discount (Life Long Learner scholarship) for students who are not eligible for Federal Financial Aid or V.A. Educational Benefits. GCD holds accreditation from the Association for Biblical Higher Education, one of four national faith-related accrediting organizations recognized by the Council for Higher Education Accreditation (CHEA). Johnson University ranks #2 on The 10 Best Online Associate in Theology Programs! Founded in 1893 in Knoxville, TN, Johnson University offers more than 50 degree programs across three different campuses and online, each aimed at equipping students for ministry. The online associate of arts and associate of science in biblical studies is a 60-credit program that emphasizes worldview issues, spiritual formation, ministry preparation, and builds a foundation for an eventual bachelor's degree. Students complete required coursework in biblical studies, theology, philosophy, history, and social and natural sciences. They also take two semesters of New Testament Greek to aid with biblical translation. Course content is delivered asynchronously via Sakai, where students submit typed assignments, participate in class forums, and view video lectures. Transfer students may test out of specific courses with a CLEP exam. Johnson University strongly encourages service learning, and transfer students must complete the same number of service learning hours as the amount of credits they need to graduate. This school makes various various scholarships available based on need and merit, including scholarships for international students. Other admission requirements include an admission essay, a high school transcript, ACT or SAT scores, and two letters of reference. The university also holds accreditation through Southern Association of Colleges and Schools Commission on Colleges, and is a member of the Council for Christian Colleges and Universities and the North American Coalition for Christian Admissions Professionals. Piedmont International University ranks #3 on The 10 Best Online Associate in Theology Programs! Founded in 1945 in Winston-Salem, NC, Piedmont International University trains students to be effective ministers in the world. Featuring affordable tuition and small class sizes, PIU offers an associate of arts in Bible that prepares graduates to serve area churches and mission fields abroad. The 64 credit curriculum coursework in old and new testament surveys, Christian ethics, Baptist history, along with two semesters of major Bible doctrine. With a nine:one student-to-faculty ratio, the online associate degree in theology can be completed in two years if taken full time, or four years if taken part time. Admission requirements include a personal testimony, a GPA of 2.0 or higher, and an ACT score greater than 17 or a SAT score greater than 1230. Piedmont offers a variety of financial aid including need and merit based scholarships, as well as aid for talent, ministry, or military experience. For high school students looking to jumpstart their higher education, Piedmont boasts a dual enrollment program to earn high school and college credit simultaneously. Previously homeschooled students can receive a 33% tuition reduction. Online coursework is delivered via Blackboard through a combination of asynchronous learning and integrated classroom experiences. Piedmont also offers accommodation for students with accessibility needs such as tutoring, extended test time, or closed captioning. Other online services available include a library, an online bookstore, academic advising, technology support, and the Piedmont alumni community. Piedmont holds a national accreditation and membership to the Transnational Association of Christian Colleges and Schools. God's Bible School and College ranks #4 on The 10 Best Online Associate in Theology Programs! Located in Cincinnati, OH and featuring 27 different programs of study, God's Bible School and College offers an affordable and convenient education. The associate of arts in Bible and theology prepares students with a biblical foundation for life, and for bachelor's studies. The 60-credit degree takes approximately two years to complete, and includes 24 general education credits, 15-20 credits in Bible and theology, three credits of church history, and two credits of ministerial education. Required courses include the doctrine of holiness, old and new testament, and systematic theology. Online associate degree in theology students enjoy small class sizes, as well as access to the student success center, academic advising, and online library services. GBS also provides a variety of counseling, most of it free or at low cost, including professional counseling, crisis counseling, and pastoral counseling. High school students can enroll in a dual credit program, which allows them to enroll in GBS courses and simultaneously earn high school credit. GBS provides both merit- and need-based scholarships, as well as a discount for the students whose parents work full time in Christian ministry. GBS hold accreditation from the Association of Biblical Higher Education and regional accreditation by the Higher Learning Commission. Ohio Christian University ranks #5 on The 10 Best Online Associate in Theology Programs! Founded in 1948 by Churches of Christ, Ohio Christian University offers an associate of arts in a Christian ministry with a biblical studies concentration. Faculty members are leaders in their fields and create an excellent academic atmosphere for students. Using asynchronous learning, students can complete this 60 credit online degree in as two years. The Christian ministry component requires courses in Old and New Testament, Earth sciences, and introduction to psychology, while the biblical studies concentration requires courses in the Acts of the Apostles, Pauline Epistles, and Pentateuch. Course content is delivered asynchronously via Edvance360, and online students benefit from additional services such as the library, technology support, and academic advising. OCU also offers OCUOnline Plus, which allows online students to gain credits through enrichment experiences such as internships with local companies and study abroad opportunities. To gain admission, students must submit an application, application fee, and a high school transcript or GED. OCU provides several scholarships to students who show commitment to academic achievement, leadership, or creativity. The financial aid office also provides tuition discounts for homeschoolers, children of veterans or active military service members, siblings enrolled simultaneously, and transfer students. Some students may also qualify for grants, such as the church matching grant, in which the university matches any aid a student receives from their local church. Ohio Christian University holds accreditation from the Higher Learning Commission and the Association for Biblical Higher Education. Warner University ranks among The 10 Best Online Associate in Theology Programs! Five miles south of Lake Wales, FL lies the main campus for Warner University, home to 1200 students representing a myriad of ethnicities and nationalities. Founded in 1968 by Church of God pastors, Warners offers an associate of science in Christian ministry designed for those working in full-time ministry. The 60-credit degree can be earned completely online while taking two courses every eight weeks, with some accelerated options available. Coursework includes the Bible, Christian faith, personal development, and general education. To gain admission, prospective students must be at least 23 years old, have a high school GPA of 2.0 or higher, two recommendations, an application, and application fee. Students are expected to regularly participate in church, chapel, and Christian service throughout their degree, as the program is designed to prepare graduates for faithful ministry in a local church, non-profit missions outreach, or community-based ministry. Online students at Warner University have access to student mental health services, disability accommodations, the library, academic advising, and an academic skills center. Nearly 98% of students receive some form of financial aid such as work study programs, grants, loans, and institutional scholarships. Annually, WU gives over $5.8 million dollars in institutional scholarships for students in need. Warner University holds accreditation from the Southern Association of Colleges and Schools Commission on Colleges. The Baptist College of Florida ranks among The 10 Best Online Associate in Theology Programs! Based in the small town of Graceville, FL and founded in 1942, The Baptist College of Florida is rooted in the Florida Baptist Convention. BCF's offers over 20 degree programs to educate and train Christian leaders for spiritual and professional growth, including an associate of divinity degree. The 66-credit curriculum prepares learners for Christian leadership in pastoral ministry by building a foundation biblical, theological, and pastoral knowledge. BCF boast a student-to-faculty ratio of 14:1 and all full-time faculty members identify as Southern Baptists. Online coursework includes Old and New Testament surveys, leading a church in evangelism, pastoral leadership, Christian history, and business math. The program culminates with a three-credit preaching practicum. To gain admission, prospective students must submit a GED or high school diploma, ACT/SAT scores, and proof of active participation in a local church. For students still in high school, BCF offers a dual enrollment program that allows high school juniors and seniors to take BCF courses and simultaneously earn college and high school credit. BCF makes available grants, scholarships and loans. The school bases eligibility for financial assistance on academic achievement, need, or community service. BCF maintains its regional accreditation with the Southern Association of Colleges and Schools Commission on Colleges. The King's University ranks among The 10 Best Online Associate in Theology Programs! Based in Dallas-Fort Worth, TX and founded in 1997, The King's University provides spiritual enrichment, a basic understanding of scripture, and training in church doctrine from a Wesleyan-holiness perspective. TKU's offers 17 degree programs from the associate to doctoral level, including a flexible and fully online associate of Christian ministries degree. This asynchronous online associate degree in theology features courses in pentecostal charismatic movements, public speaking, behavior science, biblical counseling, and psychology. The 65 credit includes 20 credits of general education requirements, 15 credits of Christian foundations, 24 credits in the major, and six electives. TKU boasts an “integrated learning” curriculum in which students serve weekly in a local church. Based on a student's preferences, they can work in youth ministries, worship services, pastoral counseling, or evangelism outreach. During each 15-week semester, online students enjoy access to services such as the library, campus bookstore, and tutoring available at the student success center. Students may also access counseling and disability services. TKU maintains an articulation agreement with the seven other ministry institutions for the purposes of transferring credits. Prospective students must submit high school transcripts, ACT or SAT scores, and an application. Transfer students must demonstrate a GPA of 2.1 or higher from all previous coursework. Financial is available based on merit, leadership, or financial need. TKY holds accreditation from the Transnational Association of Christian Colleges and Schools and Association for Biblical Higher Education, both are members of the Council for Higher Education Accreditation (CHEA). Northwest University ranks among The 10 Best Online Associate in Theology Programs! Founded in 1934 and located just outside Seattle, WA, Northwest University features over 70 degree programs from the associate to doctoral level. Rooted in the Assemblies of God tradition, Northwest's online associate degree in ministry leadership develops a foundation for graduates to grow and foster their ministry. The 60-credit curriculum explores biblical and theological studies, written and verbal communication, the humanities, social sciences, and includes optional preaching courses for those interested in ministerial credentials through the Assemblies of God church. Students at Northwest University enjoy institutional support such as mentorship, one-on-one advising, study abroad opportunities, and internships. The university also provides disability accommodations for curricular and co-curricular programs. To gain admission, students submit their ACT or SAT scores, an application and fee, and their high school transcripts. International students also need to meet English language proficiency standards, offer bank statements, and carry health insurance. NU expects all prospective students to articulate their own personal salvation experience to be considered for application. Financial assistance is available and Northwest maintains federal eligibility for grants, loans, scholarships and veteran benefits. Northwest University is accredited by the Northwest Commission on Colleges and Universities, and endorsed by the Commission on Christian Higher Education of the Assemblies of God and the Association of Christian Schools International. Nazarene Bible College ranks among The 10 Best Online Associate in Theology Programs! Located in Colorado Springs, CO, Nazarene Bible College offers an associate of arts in ministry with available concentrations in Christian educational ministries, church ministries, early education, or Hispanic pastoral studies. Founded in 1967, NBC prepares men and women for ministry, evangelism, and discipleship throughout the world. It is also one of two Nazarene universities, and the only school with specific funding to deliver multicultural contextual education. All full-time faculty members hold pastoral experience or staff roles in their own church, and adjunct faculty members also work in church ministry. The 64-credit ministry degree requires 28 credits of general education courses, nine credits on the Bible, and 23 credits within a concentration. The Christian educational ministries concentration prepares graduates for lay ministry in Christian education; the church ministry concentration includes courses in pastoral counseling and global evangelism; the early education concentration explores childhood development and teaching techniques; and the Hispanic pastoral studies concentration studies systematic theology and church planting. Online students benefit from tutoring services, counseling, and financial assistance, such as grants, loans and institutional scholarships. Nazarene Bible College holds accreditation in both The Higher Learning Commission and the Commission on Accreditation of the Association for Biblical Higher Education. What can I do with an Online Theology Associate Degree and whatwWill I Learn? Coursework in an online associate in theology will likely vary among departments and programs, particularly if the school is tied to a specific denomination or religious tradition. In general, however, a theology program provides an overview of the scriptures, church leadership, and basic questions of theology and doctrine. Some common courses are listed below. Christian Leadership: This course covers the general history of biblical leadership in the church and its challenges, and prepares graduates to be leaders within their spiritual communities. It also addresses common problems that arise within leadership and ways to biblically manage these issues within the church. Leading specific groups and congregations is also part of this course. Introduction to Church History: The course provides a basic understanding of church history, and covers the early church and its teachings. Students explore ancient churches, their history, challenges, and locations, as well as fundamental doctrines that drove the early church and its prophecies. This class can help Christian teachers efficiently communicate the history and apologetics of the faith and its beliefs. Introduction to Biblical Doctrine: This class introduces a full understanding of God through the Old Testament and New Testament, the Law, and the knowledge of the second covenant through the resurrection. It will prepare you as a missionary or pastoral leader, especially when communicating the doctrine of salvation. The Biblical Text: This course introduces interpreting scripture in the appropriate context of history, language, setting, and teaching. Students analyze the scriptures and provide research to support the evidence found in the Hebrew or Greek text. This class is beneficial to those wanting to lead a bible study, or teach as a pastor or missionary. Bachelor of Ministry: A bachelor's of arts degree with a concentration on ministry prepares graduates for any leadership role in full-time ministry work, including as a lay person in the church, or in other religious organizations like charities or missions. Bachelor of Theology: A bachelor's of arts degree with a concentration on the study of the biblical text, church teachings, and doctrines develops sound theological arguments, and explores fundamental doctrines and beliefs taught in the scriptures. Master's of Divinity: Earning a bachelor's degree can prepare you to advance to a Master's of Divinity degree program, which is often a prerequisite for pastoral ordination. Coursework explores doctrinal and textual studies, as well as how to effectively manage and lead a church.